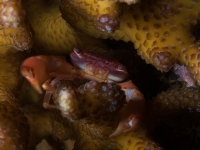 The red-dotted guard crab is a small coral crab with brown to purple carapace and red/brown claws with brown pincers. On the inside of carpus (the upper section of the claws) it has eight spines. On the upper side of the carapace you can often see rows of fine red spots. Unassessed by the IUCN Red list, but spread throughout the Indo-Pacific, mostly in the Central Pacific region. Indo-Pacific. From the Red Sea and Eastern African coast all the way to Western South American coast, up to Japan and down to Australia. It is commonly found between the branches of Acropora and Pocillopora corals, in a depth range 0-60 meters. Trapezia cymodoce feeds on zooplankton. 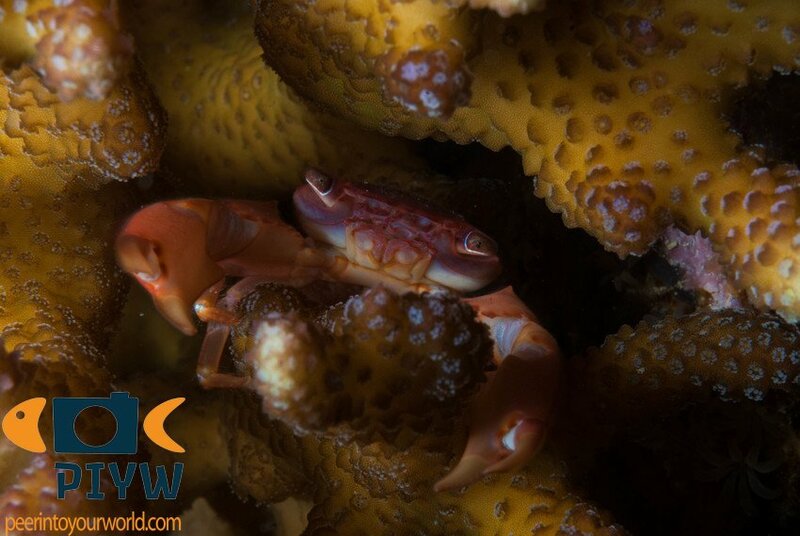 Trapezia cymodoce is also know by another common name, the lilac coral crab, which is a bit more suitable for its appearance. You can not always see the red-dotted line pattern on the carapace. They are generally difficult to spot or photograph because they hide very quickly.